WOW! Women On Writing Blog: Where's the Plot? Now that school is back in session, I’m getting geared up to play editor-mom. That is, reading drafts of stories and reports, trying to be supportive without, well, rewriting the some of the work. I love reading the beginning stories, but it continues to astound me that we read countless stories to children, but if you ask them to tell you what happened in a story, the storyline seems bland or flat. The stories don’t seem to go anywhere. Often the flat story is how the children process the stories, as well--even if the story involves a boy, his dog, kidnappings, and international spies. If I ask my children what happened in TinTin (the movie or the comic books), I may get the response about the cute dog and nothing about the story’s plot. As we develop as writers and readers, we start learning about plotting our stories. It helps us to discern what writers we like—fast-moving books generally have tightly written plots with conflicts that crackle from the pages. 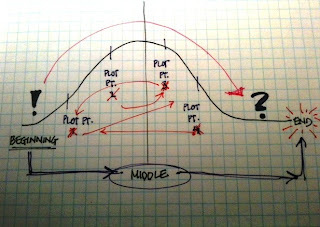 But even so, plots can still be a confusing muddle. How do you plot a story? 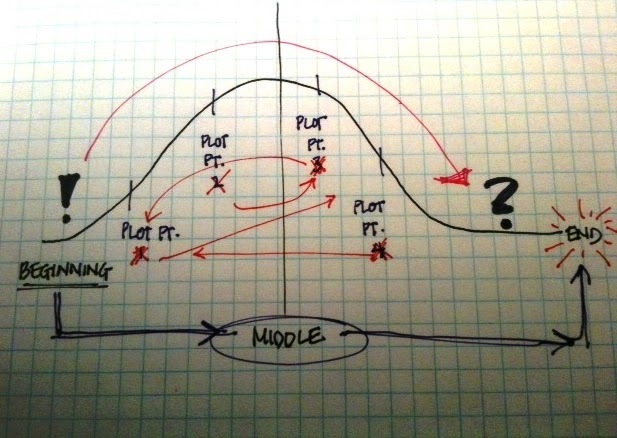 How do you ensure the plot points are strong and build to the middle and bring the story to a good conclusion? Take your time. Work those out as you work with your draft. It’s not a one-time happening, but something that is massaged along your novel or short story’s journey. Sure, the cute dog is important, but he’s vitally important because he and his actions help move the plot along. Do you sketch out your plot points in an arc in the beginning, middle or end of writing your story's first draft? Elizabeth King Humphrey is a writer and editor living in North Carolina. She enjoys using various colored pens to plot her novel’s storyline, but sometimes gets carried away and starts doodling instead. I have also had kids "graph" the events of their story like a bar graph. The less exciting events have short bars, and the exciting climax of the story gets the longest bar. I don't usually write fiction, so I don't ever sketch anything. But with NaNoWriMo coming, perhaps I will consider it. I don't sketch out, because my stories seem to write themselves, but I make sure to always keep the action moving along. If I'm writing a chapter and I'm not excited about it, it's probably useless dead space. I remember an incident in elementary school in which I took this one-on-one reading test. I was told to come into an empty classroom with a lady I didn't know, read over a short story, and then answer questions about it. So I read it over and memorized what happened, what I was supposed to learn from it etc. And then the test proctor started asking questions like: "What school did the main character go to? What was the name of his best friend?" And, at age eight, I was thinking, "Really? This is what they think is important?" The district must have thought they were asking "easy" questions, but trifling details are not what sticks. Maybe children's writers, like my school district, think settings and characters are the story. Maybe they consider flat stories "safe," because we're not supposed to expose children to potentially upsetting things. Story arcs revolve around conflict. No conflict, no upset, no dissonance, no story. You'll just end up with a book about a cute dog. Does a Freelance Writer Need a Resume?